CLEVELAND, OH, USA, August 29, 2018 /EINPresswire.com/ -- Two-time Guinness World Record™ holder, author, presenter, and travel adventurer Graham Hughes announces his newly-released audiobook. 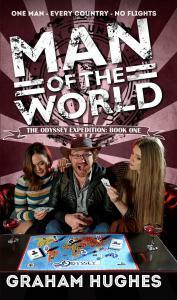 “Man of the World: Book 1 of The Odyssey Expedition” is the riotous account of the first year of British adventurer Graham Hughes’s daring Guinness World Record™ attempt to visit every country on Earth using only surface-based transportation, told with refreshing candor in his own words and now, in his own voice! "Recording an audio book is an enormous amount of work" reflects Graham. "But who can do me better than me? Plus I'm the only one who would be able to pronounce everything incorrectly in just the right way!" Covering the first 139 countries & territories of The Odyssey Expedition, “Man of the World” is much more than a travelogue; it’s an epic tale of grit and humor, dizzying highs and crushing lows, a snapshot of the world seen through the eyes of a man who “eats impossible for breakfast”. Listeners join Graham as he treks through The Americas on increasingly grotty buses, hitchhikes around The Caribbean on a variety of unseaworthy vessels, speeds around Europe on insanely fast trains and then plunges head-first into Africa with only his backpack and his natural charm to protect him. Which is probably why they locked him up in Cape Verde. And again in Congo. The print edition received a coveted "starred review" from Kirkus who called it "A riveting journey recounted by an irrepressible, highly likable narrator." For Graham The Odyssey Expedition was more than just a quest to see the world or set some records. He calls it “...a rib-tickling multinational caper of courage, tenacity, love, friendship, danger, panic, passport stamps and geopolitics, washed down with copious amounts of alcohol.” Graham is anxious to get going on books 2 and 3 (in which he eventually completes his epic journey) and of course he is always planning his next grand adventure. ATBOSH Media Ltd. in Cleveland, Ohio is more than just Graham's publisher. As an Agency Press they also serve as his literary agent for both the book and its derivative works - including books 2 & 3 as well as the television and film rights. "We are a different type of publishing entity," says Jared Bendis. "Instead of shopping around Graham's amazing project and waiting for a larger publishing house to say 'yes', we actually published the book and will now be shopping it around to larger houses for them to take it to the next level." Larger publishing houses interested in publishing or distributing the work or production companies interested in optioning the work should contact Jared Bendis directly at jared@atbosh.com or call 216-288-6349. 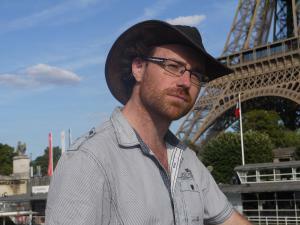 Graham Hughes is an author, presenter and filmmaker from Liverpool, England. He’s been called “The Thinking Woman’s Indiana Jones”, “The World’s Most Adventurous Man” and “Bill Bryson for the Millennial Generation”. He is the only person to have visited every country in the world without flying. While on his journey he presented the travel series “Graham’s World”, which was commissioned by National Geographic, produced by Lonely Planet, distributed by BBC Worldwide and broadcast in over 50 countries around the world. After his record breaking expedition, he won a tropical island on a game-show, subsequently spending the next few years living there off fish and coconuts. Graham has now returned to the UK to help inspire the next generation to get out there and see the world for themselves. 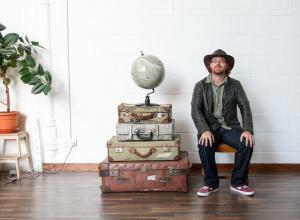 Graham is available for speaking engagements, book signings, and other adventures when called upon. Print: Ingram, Amazon, B&N (and wherever adventurous book are sold). E-book: Kindle, Nook, Apple, Google, & SmashWords. Audio: Audible, Amazon, & iTunes.